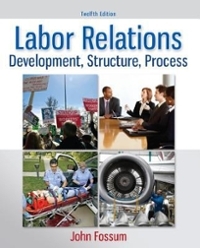 Labor Relations 12 Edition Labor Relations: Development, Structure, Process by John Fossum presents the history and development of labor relations, bargaining structures and issues, and the process of negotiations and contract administration. The 12th edition addresses the increasing importance of health care costs, access, legislation, and regulation. Fossum explores the structure and internal politics of union organizations, union organizing and union avoidance, while reflecting and balancing the viewpoints of both labor and management, including economic, institutional, and behavioral perspectives.